Lodged in the Northern District Court of California, the complaint levels multiple claims targeting MacBook models manufactured from 2015 and MacBook Pro models produced from 2016. Both laptops feature the company's butterfly keyboard mechanism, an ultra low-profile switch advertised as both more responsive and robust than traditional scissor-type components. According to the filing, "thousands" of MacBook and MacBook Pro owners have experienced some type of failure with Apple's butterfly keyboard, thus rendering the machine useless. Specifically, the suit claims the design is such that small amounts of dust or debris impede normal switch behavior, causing keystrokes to go unregistered. In extreme cases, the key fails, forcing owners to take their laptop in for service at a Genius Bar or authorized Apple repair facility, a trip that could cost hundreds of dollars if the machine is out of warranty. One named plaintiff, Zixuan Rao, purchased a new 15-inch MacBook Pro in January and began to experience problems with the laptop's "B" key about a month later. After attempting to clean out the key on his own, Rao ultimately sought help from the Apple store in April. Representatives were unable to fix the issue and suggested repair under Apple's gratis one-year warranty. Not able to wait the one week it would take to fix the machine, and unconvinced that a repair would permanently solve the issue, Rao declined the offer and purchased an external keyboard. A second named plaintiff, Kyle Barbaro, went through a similar experience with his 2016 MacBook Pro. Unlike Rao, Barbaro opted to fix unresponsive space bar and caps lock keys through Apple's repair process, which worked for a few weeks before space bar failed a second time. Barbaro returned to his local Apple store, but the Genius Bar representative was unable to solve the issue using conventional tools. As Barbaro's MacBook Pro was at this point out of warranty, he was told it would cost more than $700 to repair. He decided not to pursue the costly fix. The suit also cites numerous complaints users posted online, including Apple's own Community Support forums. Apple introduced the butterfly mechanism with its 12-inch MacBook in 2015. Touting the new hardware technology onstage, SVP of Worldwide Marketing Phil Schiller characterized the keyboard as "much more precise, and accurate. In fact it is four times more stable than that scissor mechanism." Butterfly mechanism switches made their way to Apple's professional laptop lineup with the redesigned MacBook Pro in 2016. A second-generation design, the keyboard was advertised as being more responsive and comfortable than the previous version. 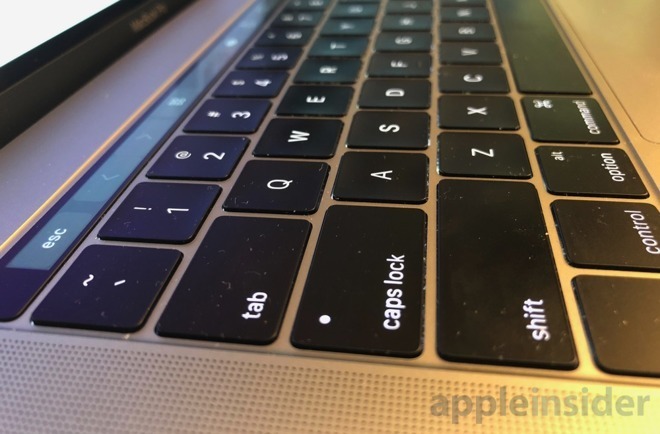 Last month, an AppleInsider investigation into the issue, collecting data from Genius Bar locations and authorized third-party shops to find the 2016 MacBook Pro's keyboard failed roughly twice as often in its first year of use as 2014 and 2015 MacBook Pro models with scissor-type switches. Current 2017 model year versions fair a bit better, though the model has not been available for a full year. Shortly after the report, a Change.org petition — cited in today's class action — called on Apple to recall all MacBooks with butterfly switch keyboards, saying the hardware design is inherently flawed. The petition garnered 17,000 signatures in just over a week. Apple has in some ways acknowledged the problem, though not directly. For example, support documents detail a method of cleaning the keyboard with a can of compressed air, a technique that rarely works, according to those who have experienced serious complications. Plaintiffs assert breach of express warranty, breach of covenant of good faith, breach of the implied warranty, violation of the Magnuson-Moss and Song-Beverly Consumer Warranty Acts, violation of the California Unfair Competition Law, violation of California's Consumer Legal Remedies Act and fraudulent concealment. The suit seek damages, legal fees and demands Apple not only publicly disclose the keyboard design flaw, but pay to remedy or replace defective units. The latter demand includes reimbursement for the purchase of replacement laptops. Plaintiffs are represented by Girard Sharp.